Although Ed Harris is one of the actors that I seem to enjoy in everything he does, this is not about the 2001 war film in which he starred. Last year at this time, I wrote an article entitled “Not Gideon’s 300” referencing the resiliency of our NE Lady Saints. They had exactly three women on the roster before the season began, yet managed to pull together a successful season and engage in recruiting new members at the same time. New year, new challenge. In 2018, they had a full roster of very committed women, including the return of a seasoned veteran, so the enemy chose a different tact to try to discourage them…cancellations! 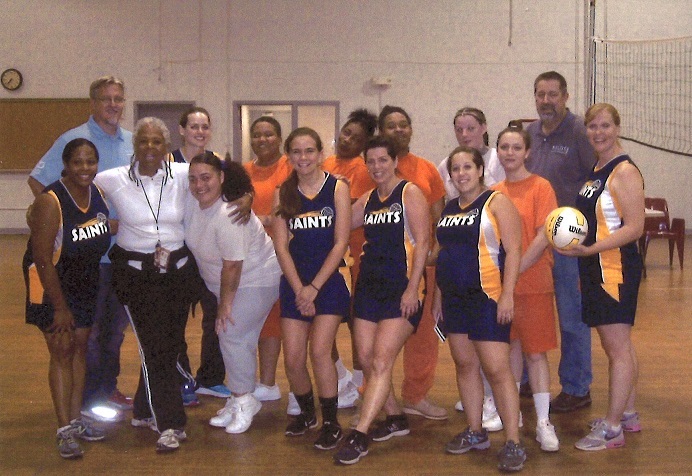 They typically visit women’s prisons in the tristate area once a month and the schedule this year reflected exactly that. Yet they have only been able to conduct two events since August due to multiple excuses from prisons – including one prison where we arrived at security with a copy of the prison’s own gate memo in hand and were still denied entry! Please add our Lady Saints to your personal prayer lists throughout 2019 – when the season rolls around this fall, we are coming back with a vengeance and Satan is going to have to find a new way to try and stop us! On Day 1, I’m playing first base and coaching first as well, talking trash in love to the inmates in the stands and on the other team. A guy approached with a funny look on his face and he says, “You ain’t from Jersey, like the rest of these guys! Where are you from”? I said, “I’m from Georgia.” He replied “Where in Georgia?” When I told him I am from Austell, he was dumbfounded! He said he was too: he went to the same middle school and high school I attended, and he lived less than three miles from where I was born and raised! He is a fellow believer and we talked for about an hour, encouraging each other in the process. He shared his poetry with me and said when he gets out he would like to keep in touch. I don’t know if the team needed me in Ohio, but God obviously did! Two Georgia boys in Ohio! He’s a big, big God! *Editor’s note: Ben is a member of the Illinois Saints softball team and, after years of prodding from their coach, he joined 14 of his brothers-in-arms on the Arizona crusade in April. The crusade ended right after our Spring edition went to print, but this is his reaction to that experience as recounted at the time. All last week, I was telling my co-workers and customers that I was headed to prison for 4 days. After a short moment of silence and discomfort from them, I explained that my passion in this life is to see men get free from guilt, shame, condemnation and truly step into becoming “free indeed”. Similar to the 80’s movie classic “The Breakfast Club” our team was comprised of men from all walks of life—business men, factory workers, church and ministry leaders, current and former military personnel, an IT wizard, an addiction counselor and even a 76 year old former professional baseball player. This was God’s plan. Through these men, we experienced breakthroughs in both the prison yard and in our personal lives. We played 13 games in prison, winning 7 of them. 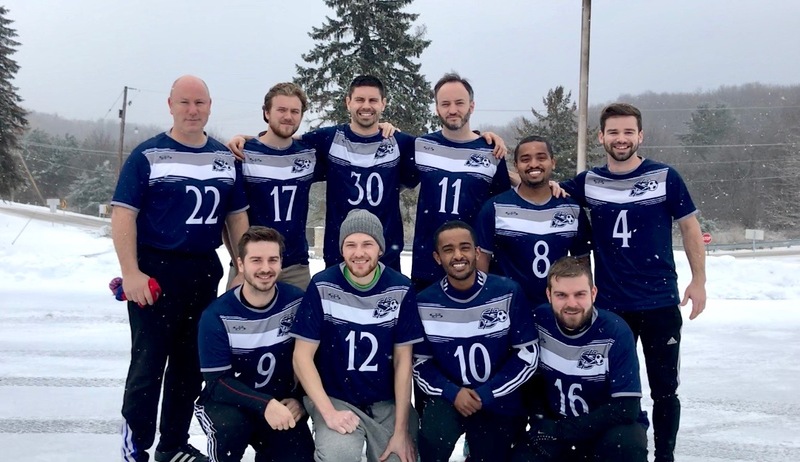 The most significant day though, was our fourth and final visit—a second trip back to FCI Phoenix to play their all-star team. Crusade veterans speak of the 4th day as traditionally a white towel waving experience of exhaustion and body aches. Instead, we were lead into battle by two of our most talented leaders Rodney and Rob with prayers of Holy Spirit healing and a 100% all-in mentality. With Andy and Gibby as our coaches, we forged the path to rise up and win all three games that day! Most of us experienced a miraculous sense of fresh legs and endurance; and on top of that—we had capped off a crusade that saw 76 men give professions of faith to Jesus Christ. This can only be explained by God’s abundance of grace. We don’t even deserve it, yet He pours out His grace freely like the Good Father that He is. After the last visit, we spent close to 2 hours in a hotel conference room eating pizza, investing time in God’s Word and speaking life over one another through encouraging speech in what we dubbed “word gifts”—knowing that each of our lives have meaning and value through the shed blood of Jesus. It was in this time that our team of seemingly random strangers a few days earlier became a brotherhood of sons sent to accomplish the Father’s work. This night was transformational and encapsulated the Holy Spirit’s influence on our week. It’s safe to say that after my first crusade, I will never be the same. Sunday afternoon, I will come back to Peoria, Illinois with a passion to love my family, to serve my workplace and to give grace as the Father flows through me—all because of 15 men that were willing to lay down their lives for one another. To God be the glory! At some point during a Saints Crusade, probably during a devotion or pregame speech, someone will quote Joshua 1:9 and tell the team that we must be strong and courageous, that we are a band of brothers who are ready to storm the gates of hell, that we are here to chew bubblegum and share the Gospel, and …… you get the picture. Unfortunately, not everyone is totally equipped to handle the REAL struggles that come with a Crusade. After going on 13 different Crusades, I have a pretty good grasp on how to navigate through some of the tougher situations, so here are my tips for surviving a Saints crusade. First of all, this guy will be in denial that he has a snoring problem. He will claim that his wife is overreacting about his snoring and that he knows more about sleep apnea than your average pulmonary doctor! With that being said, he is now YOUR problem once the lights go out. YOU CAN’T SMOTHER HIM WITH A PILLOW (It doesn’t look good for the ministry and isn’t good for your testimony!). The key to dealing with him is earbuds. You pop those babies in and you can fall asleep listening to a classic movie soundtrack, a good book, or your favorite Weird Al Yankovic songs! If your roommate is a major league snorer and can overpower Weird Al, you can always get caught up on sleep when you return to work on Monday. You may choose to insert Chinese, Thai, Guatemalan, or other foreign cuisine here, but there will come a time when whoever is picking food will choose something you don’t like. I have the appetite of your average 12 year old. I like pepperoni pizza, fries, chocolate milkshakes, and that is about it (My wife can verify this and can also verify that this is not one of the qualities that attracted her to me). Looking up and down the menu you will either find nothing you like or you will not be cultured enough to know what anything on the menu is! Relax, because there are three fixes to this scenario. 1. Is it ok for you eat just queso and chips for dinner? Yes, yes it is! 2. Get up and tell the guy next to you that you are using the bathroom, then sprint across the parking lot to the Wendy’s for a Baconator and a Frosty; it’s WAY better than the Gordita surprise that everyone else is ordering. 3. Quietly order the chicken fingers off the kids menu and just tell the rest of the team that the restaurant messed up your order! There are limited times to use a bathroom during a prison visit, and playing softball while having to use the restroom is the worst. Most of the time you will have a chance to use one in the lobby of the prison, but chances are your snoring roommate is using it the entire time that you are checking in through security. If it happens during a game, the last person you want to talk to is the coach; he will just tell you to tough it out. The person that you should talk to is the officer in charge. They will sometimes “airlift” you in a golf cart from the yard to a wonderful staff restroom. While you are gone, the coach will just have to find someone else to play out of position in your spot! If you really are inclined to smother a teammate with a pillow, now is the time to do it! This conversation will start out with something really brilliant like, “Those IDIOTS who voted for (scoundrel politician) should be shot!” The reply will be even more brilliant and sound something like this, “Oh yeah, well if (deadbeat representative) had done something, then we wouldn’t have the budget/jobs/stray cat crisis that we do now!” This pointless, mind-numbing conversation will last for hours unless someone lies on a grenade and changes the subject. If you are traveling with the IL team, a comment like “I don’t think Jay Cutler got a fair shot in Chicago” or if you are traveling with the PA team something like, “I really wish we would have given Dominic Brown one more chance”, should bring unity to the bus. Unfortunately, they will now be unified in destroying the guy who changed the subject! 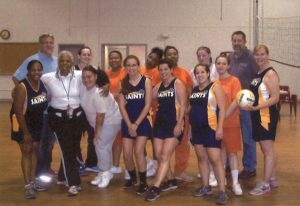 Are Saints Prison Ministry Crusades for the faint of heart? Not really, but after reading this you are well-prepared to survive any of the major dilemmas that come up on a Saints Crusade!